Just like their human owners, dogs have a variety of personalities. Some are gregarious and will happily greet everyone they meet, while others may hide behind their owners when strangers approach. Some are laid back and mellow, others are more high-strung. While it’s normal for pets to express their natural personalities, excessive negative emotions can become unhealthy for your dog’s well-being. Although it’s appropriate for animals to feel fear and anxiety in response to stressful situations, these emotions should not escalate to the point that they interfere with a pet’s normal life. So, how do you know if your dog’s fear and anxiety are out of control? 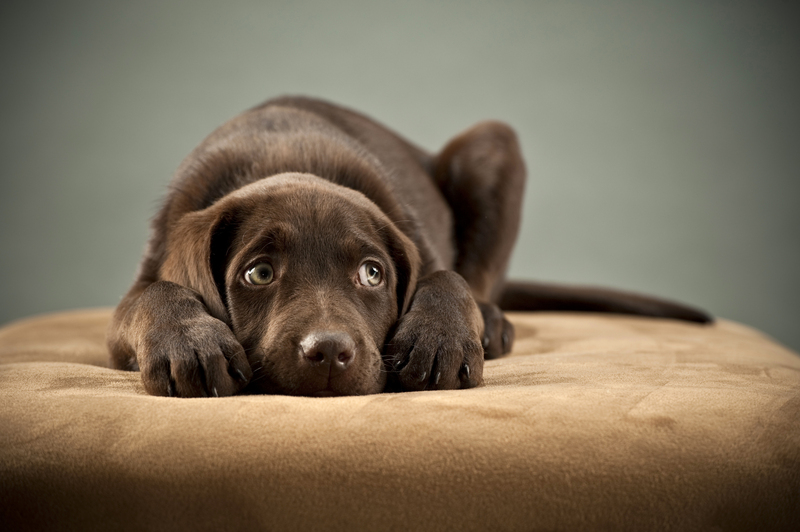 Let’s look at three common anxiety disorders that can affect your canine companion. If your dog becomes abnormally anxious during thunderstorms or fireworks, your veterinarian can help determine whether his reaction is normal or if he has an anxiety disorder. If your pet is diagnosed with noise anxiety, the good news is that there are many forms of treatment that can help. Many of them involve desensitization techniques to help your dog dissociate his negative feelings from noises. There are also many products, such as Thundershirts, that can be used to calm anxious dogs. Your veterinarian may also decide to prescribe anxiety-reducing medications if other methods do not help. Separation anxiety is a severe form of anxiety that can be detrimental to your dog’s mental and physical health. If your dog displays these or other destructive behaviors when left alone, your veterinarian can help determine whether he has separation anxiety. Affected dogs can be treated, but improvement will take patience and diligence on your part. Treatment often involves consultation with a veterinary behaviorist combined with calming medications prescribed by your veterinarian. Exposure to many different types of people and animals at an early age helps dogs become comfortable and confident in different situations. When socialization does not occur—more common in puppy mill pups and stray pooches—dogs may develop an unnatural fear of strange people and animals. When a dog with social anxiety is approached by a stranger, his fight-or-flight response jumps into action. He will likely attempt to escape by hiding behind you or running from the area. If the stranger continues to approach to try to win him over, your dog will feel cornered and may attack or bite to escape. It’s important to understand that a dog with social anxiety is not an aggressive dog, but a dog that believes he has no other option but to attack if cornered. A dog with social anxiety can be socialized as an adult, but it is a much longer and more tedious process than when he was a puppy. A veterinary behaviorist can help you develop a plan for socialization. Calming products, such as Thundershirts (used for many types of anxiety) and anti-anxiety medications, can also help anxious dogs during socialization. Questions about anxiety in your dog? Call us today!